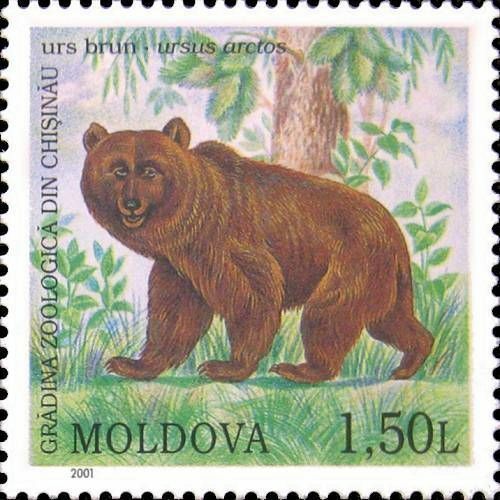 On 14 July 2001, the Post Office of Moldova (Poșta Moldovei) issued a series of postage stamps with the title Chişinău Zoological Gardens. The issue comprises five stamps, one on a souvenir sheet, with associated cancellation (postmark) and first day covers (FDC). The designer was Oleg Cojocaru. The printing was performed by Bundesdruckerei, Germany. The Bengal tiger (Panthera tigris tigris) is the most numerous tiger subspecies. Its populations have been estimated at 1,706–1,909 in India, 440 in Bangladesh, 163–253 in Nepal and 67–81 in Bhutan. Since 2010, it has been classified as an endangered species by the IUCN. The total population is estimated at fewer than 2,500 individuals with a decreasing trend, and none of the Tiger Conservation Landscapes within the Bengal tiger's range is large enough to support an effective population size of 250 adult individuals. Read more.. 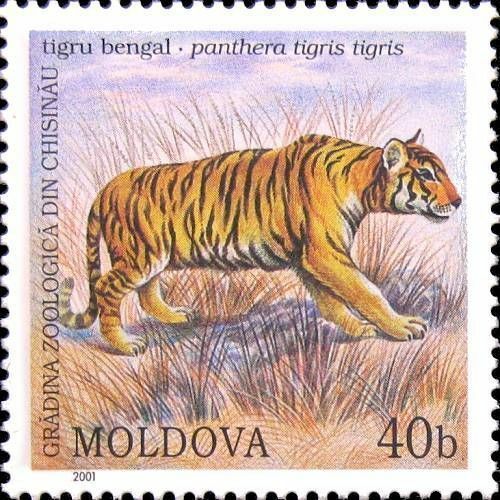 This article uses material from the Wikipedia article 'Bengal_tiger', which is released under the Creative Commons Attribution-Share-Alike License 3.0. 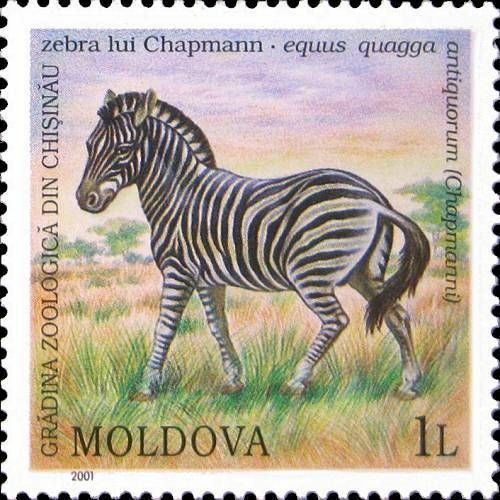 Chapman's zebra (Equus quagga chapmani) is a subspecies of the plains zebra. They, like their relatives, are native to the savannah of north-east South Africa, north to Zimbabwe, west into Botswana, the Caprivi Strip in Namibia, and southern Angola. The Chapman's zebra eats mainly grass and occasionally shrubs. They are currently at low risk status on the endangered species list, but like all other animals are at risk because of habitat destruction and illegal poaching. Read more.. This article uses material from the Wikipedia article 'Chapman%27s_zebra', which is released under the Creative Commons Attribution-Share-Alike License 3.0. The brown bear (Ursus arctos) is a large bear distributed across much of northern Eurasia and North America. Adult bears generally weigh between 100 and 635 kg (220 and 1,400 lb). Its largest subspecies, the Kodiak bear, rivals the polar bear as the largest member of the bear family and as the largest land-based predator. There are several recognized subspecies within the brown bear species. In North America, two types of the subspecies Ursus arctos horribilis are generally recognized—the coastal brown bear and the inland grizzly bear; these two types broadly define the range of sizes of all brown bear subspecies. An adult grizzly living inland in Yukon may weigh as little as 80 kg (180 lb), while an adult coastal brown bear in nearby coastal Alaska living on a steady, nutritious diet of spawning salmon may weigh as much as 680 kg (1,500 lb). The exact number of overall brown subspecies remains in debate. Read more.. This article uses material from the Wikipedia article 'Brown_bear', which is released under the Creative Commons Attribution-Share-Alike License 3.0. 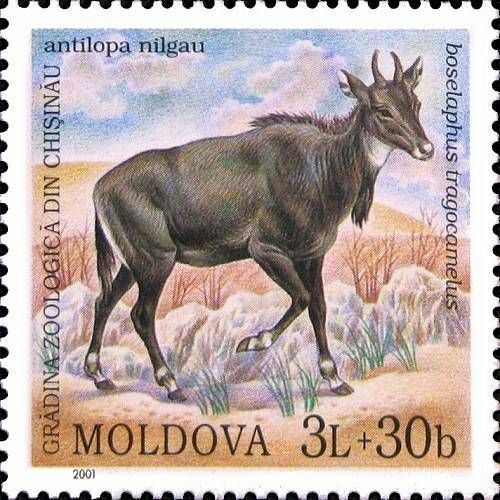 The nilgai (Boselaphus tragocamelus), sometimes called nilgau, is the largest Asian antelope. It is one of the most commonly seen wild animals of central and northern India, often seen in farmland or scrub forest. The mature male appears ox-like and is also known as the blue bull. A blue bull is called a nil gai or nilgai in India, from nil meaning blue and gai meaning a bovine animal (literally 'cow'). It is also present in parts of southern Nepal and eastern Pakistan. The species has become extinct in Bangladesh. It was known as the nilghor (nil = blue, ghor = horse) during the rule of Aurangzeb in the Mughal era. It is the only member of genus Boselaphus. Read more.. This article uses material from the Wikipedia article 'Nilgai', which is released under the Creative Commons Attribution-Share-Alike License 3.0. The lion (Panthera leo) is one of the four big cats in the genus Panthera and a member of the family Felidae. With some males exceeding 250 kg (550 lb) in weight, it is the second-largest living cat after the tiger. 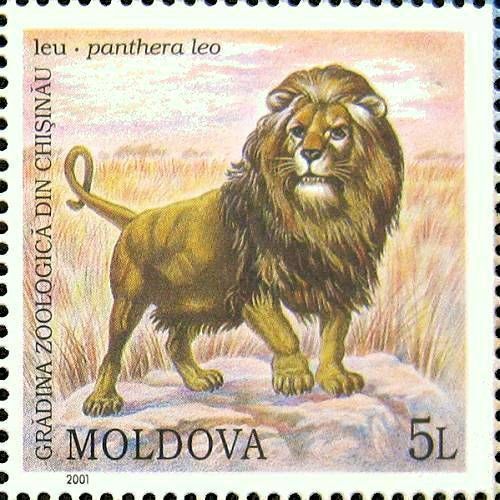 Wild lions currently exist in sub-Saharan Africa and in Asia (where an endangered remnant population resides in Gir Forest National Park in India) while other types of lions have disappeared from North Africa and Southwest Asia in historic times. Until the late Pleistocene, about 10,000 years ago, the lion was the most widespread large land mammal after humans. They were found in most of Africa, across Eurasia from western Europe to India, and in the Americas from the Yukon to Peru. The lion is a vulnerable species, having seen a major population decline in its African range of 30–50% per two decades during the second half of the 20th century. Lion populations are untenable outside designated reserves and national parks. Although the cause of the decline is not fully understood, habitat loss and conflicts with humans are currently the greatest causes of concern. Within Africa, the West African lion population is particularly endangered. Read more.. This article uses material from the Wikipedia article 'Lion', which is released under the Creative Commons Attribution-Share-Alike License 3.0.